1. How each type of skincare product works. 2. Why you need a given skincare product. 3. When it should be applied in your routine. 4. What results you can expect. Whether you use a Paula’s Choice Skincare Essential or Advanced routine or custom-select products based on what works best for you and your specific skin concerns, this step-by-step guide will set you on the path to the best skin of your life. Cleanser (Step 1) Gentle, water-soluble cleansers remove debris, oil, and makeup. 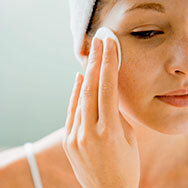 Cleansers help wash away substances that can lead to clogged pores and dull skin. Starting with a clean face allows the skincare products you use afterwards to work even better. With a Paula's Choice cleanser, your skin will look and feel softer and healthier, plus be primed to receive maximum benefits from your other products. Toner (Step 2) Well-formulated toners hydrate, refresh, and rebalance skin, among other benefits. Toners add vital skin-replenishing ingredients immediately after cleansing. They also help diminish the look of redness and dry patches, while removing the last traces of makeup. Paula's Choice toners deliver replenished and soothed skin. Those with oily skin may see visibly minimized pores. Exfoliant (Step 3) Leave-on AHA and BHA exfoliants gently remove built-up dead skin for smoother, noticeably renewed skin. Environmental damage and other factors cause the surface of skin to become dull, rough, and uneven. Exfoliating eliminates this buildup, which otherwise would cause clogged pores and uneven skin tone, and worsen the appearance of fine lines and wrinkles. Paula’s Choice exfoliants unclog pores, help minimize redness, diminish the look of wrinkles, hydrate, and visibly improve an uneven skin tone. Your skin will look radiant, smoother, and younger (seriously). Take this quiz to find out which exfoliant is right for you. Acne Treatment (Step 4, if needed) An acne treatment with benzoyl peroxide helps prevent new acne. When acne is your concern, research shows that topical treatment with benzoyl peroxide is an essential step for achieving clear skin. With consistent use, you will see fewer breakouts and a reduction in large, red, swollen pimples. After cleansing, toning, exfoliating (and applying your acne treatment, if needed), layer your serums, moisturizers, and other treatments in order of thinnest to thickest texture. Keep in mind that developing a more advanced routine may take some experimentation to discover which method and frequency of application works best for you. You don’t have to apply every anti-aging product in your routine every single day—alternating different products on different days can work great. Here’s an example of what that might look like. Anti-Aging Boosters A booster focuses on the unique capabilities of a particular ingredient used at a high concentration with supporting ingredients. Boosters tackle specific skin concerns like enlarged pores, dehydration, dullness, discoloration, and so on. Their lightweight formulas work synergistically with your other skincare products to quickly achieve the results you’re looking for. Results depend on which Paula’s Choice Booster you choose. Discover the ideal booster for your skin concerns here, and note you can layer or alternate boosters for customized results. Serum (Step 4 if you're not using an acne treatment or skin lightener; otherwise, those go on first) Serums help soften the visible signs of aging for healthier, younger-looking skin. Serums filled with antioxidants and other anti-aging ingredients help defend your skin from environmental assault, including the visible effects of pollution. Paula’s Choice serums improve your skin in numerous ways, from calming redness to improving the appearance of wrinkles and skin texture, and helping skin look and feel more radiant and firm. Skin Lightening Treatment Skin lighteners that contain hydroquinone gradually fade brown spots and discolorations, whether from sun exposure or other factors. If you have brown spots, “age spots,” or other tan to brown discolorations, using a skin-lightening treatment will help make your skin tone more even and radiant. After 8–12 weeks of daily use, you will see discolorations fade or possibly disappear completely. Ongoing use is needed to maintain results and daily use of a broad-spectrum sunscreen is required. Anti-Aging Moisturizer State-of-the-art moisturizers contain skin-restoring ingredients that instantly hydrate and lock in moisture, while delivering anti-aging benefits. Used daily, moisturizers improve skin’s appearance, helping to keep it feeling smooth, plumped, and soft. When you use the right Paula’s Choice moisturizer for your skin type, dry, dull, or flaky skin will be replaced by skin that looks visibly smoother, younger, and replenished!! Anti-Aging Moisturizer with SPF (always the last step in your morning skincare routine) This essential morning step keeps your skin protected from the short- and long-term visible effects of sun damage. (Opt for broad-spectrum SPF 30 or higher.) Our sunscreens with antioxidants are essential to protect your skin from UV light exposure, which is the #1 cause of wrinkles, uneven skin tone, loss of firmness, and many other signs of aging. Protecting your skin from further sun (UV) damage allows it to begin looking younger and healthier. With liberal daily application, you will see fewer signs of aging and significantly cut your risk of skin cancer. The following simple, step-by-step routine covers the basic types of products everyone should use, and the order in which to use them, day and night. These steps apply regardless of skin type. If you’re concerned with signs of aging, large pores, uneven skin tone, redness, or breakouts, an Advanced Routine is your best bet. It includes targeted solutions and/or boosters that build on the foundation of the Essential Routine to address your personal skincare concerns while being compatible with the needs of your skin type. We left this step out of our routine guide because your daytime and nighttime moisturizers can absolutely be applied around your eyes. However, if you wish to use a separate eye product, choose it based on how dry the skin around your eyes is and on other concerns you might have, such as wrinkles, dark circles, or puffiness. During the day, always apply eye cream or gel before sunscreen, or look for an eye cream that has built-in sun protection.